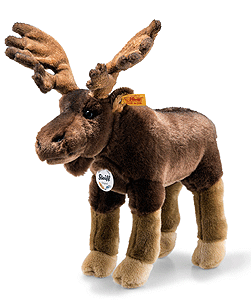 Edvin Elk is hand made in the finest brown cuddly soft woven fur. Edwin the brown elk stands at a proud 30 cm tall with his stately antlers. Airbrush details in contrasting colours at the corners of the eyes, nostrils and mouth give Edvin a realistic look together with his incredibly soft faux fur. The shading starting at his brow and running down his back creates another enchanting accent. His legs feature a variety of brown shades and have supporting rods in them to help him maintain his stance. Featuring a tuft of hair on his chin and an identification tag with feathers by his neck.